Are you sick of pushing that heavy gas-powered lawn mower around the yard? 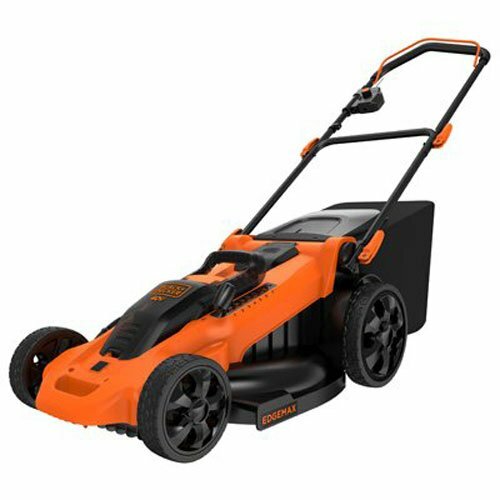 How does a mower that is light, doesn’t need gas and is almost silent sound? “Perfect” You say? Well, you might just be interested in the latest generation of cordless lawn mowers. But don’t just go out and buy the model that the freckle-faced teen at home depot told you is the “best cordless lawn mower available“, take some time to do your research and pick the model that suits your specific requirements. We have done all the hard work for you and spent hours researching, reviewing and trying out numerous different models of cordless mowers. 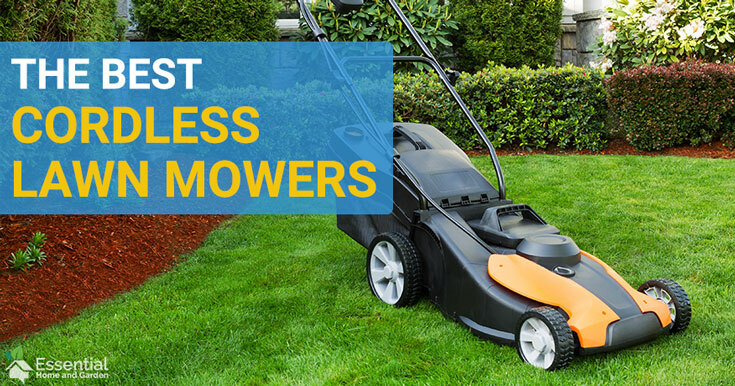 So take your time, read through this list and the in-depth reviews and choose the best electric lawn mower that is right for you. And when you do make the purchase, be sure to let us know what you chose and how you think it performs! Want to skip the technical stuff and just get a quick recommendation? Well you can find our top choices right here. If you want the more detailed explanation and a few more models to choose from then keep reading. A well built mower with a super powerful 80v mower. This one rivals even gas powered machines! Light and maneuverable with a brushless motor. 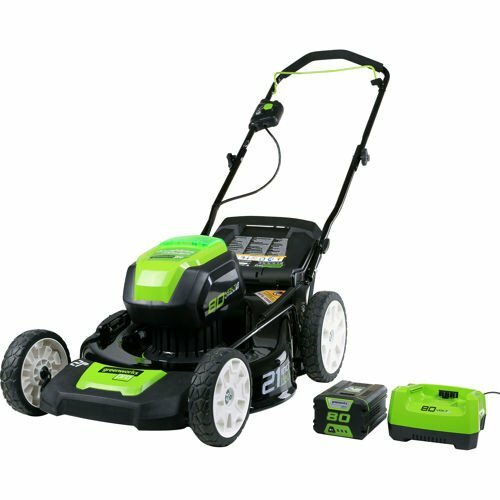 This battery powered mower is a great price without sacrificing quality. The GLM801602 is one of the top models Greenworks range of cordless mowers, and it brings with it some vast improvements from cheaper models. 80-volt batteries, A brushless motor, larger deck width and a steel deck are just some of the improvements over previous models. But does it do what it’s meant to? Most cordless lawn mower models are 40 volts these days, but not this baby. It even outdoes the Ego 56V models by a long shot – How does 80 volts sound? These 80-volt batteries provide some serious power to the motor and give it the grunt it needs to mow even in the toughest of conditions. Just be careful when buying the GLM801602 because some packages come with 2AH batteries which I seriously would recommend avoiding if you value a decent run time before needing to charge your batteries. We also loved the quick charge time of these batteries, in just 1 hour your 4 AH battery will be fully charged and ready to go again – lash out and buy yourself an extra battery and you can keep swapping them and mow all day! The digitally controlled brushless motor means that if anything is going to go faulty on the mower, it shouldn’t be the engine. 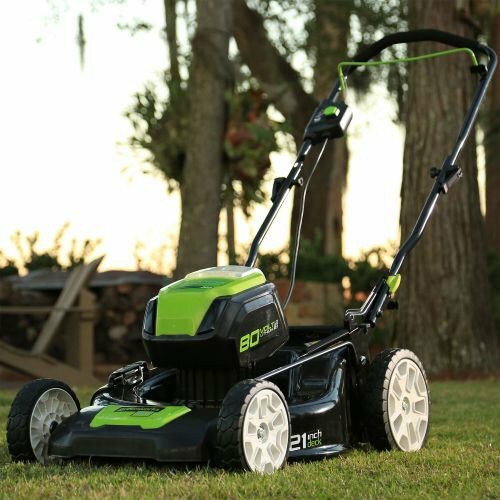 Wear and tear is reduced due to its brushless design and the power it provides will rival most gas most gas-powered mowers. I wish these mowers were around when I was a kid, I would love to take it apart and fit the motor into a homemade go kart – it would rocket along! But, in all seriousness, this mower has enough power to tackle almost anything you can throw at it. While the power levels of the Greenworks Pro 80V cordless mower are huge, the noise levels aren’t. In fact, this mower is quieter than your standard home vacuum cleaner so you won’t annoy your neighbors when you are mowing just before dark when it’s nice and cool. A common problem with some cheaper models of battery powered lawn mowers is that they feel cheap. It’s kind of hard to explain because there is nothing actually wrong with them, they just feel like if you decide to run into that stone feature in the center of your yard they will snap in half. Well, this is NOT the case with the Greenworks 80v model. It is manufactured with higher grade plastic and the deck itself is steel. The axels and wheels are also much stronger than previous models and you should have a problem with them bending or breaking. The only complaint we did have with this mowers design is the fact that due to the hollow back design of the wheels, they fill up with junk and debris meaning you clean freaks out there will be forever digging it out with a stick before packing it way. The cut quality is quite good and because the blades come very close to the edge of the deck, you can cut right up to the edges meaning edge trimming required after mowing is minimal. This build quality is backed up by a 4 year warranty and by all reports, Greenworks are great to deal with if you do happen to have any issues. Despite it being the heaviest mower on our list, the GLM801602 actually quite easy to maneuver around and do to the large wheels it feels a lot lighter than it actually is. It would be great if it was self propelled, but we can see why Greenworks elected to leave this feature out as it does not feel like it needs it at all. The Greenworks Pro GLM801602 is available from Amazon. The Greenworks Pro 80V cordless mower is a powerful machine that also has a suprisingly good run time. There are very few downsides to this machine, and none of them are major. Sick of Fertilizing Your Lawn By Hand? Check out our guide on lawn fertilizer spreaders. Who can say no to a 20” deck? Well not us, and that deck size is just one of the reasons why the EGO Power+ LM2001 is one of our favorite electric mowers we have reviewed so far. Sure, there are other mowers out there that include a cutting width this big, but this one gets the chore done quickly, easily and with minimal fuss. 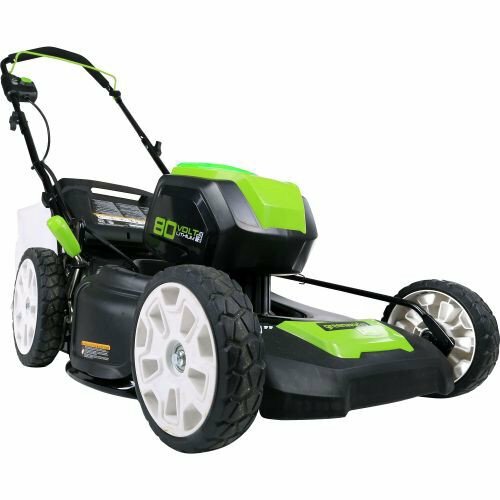 The battery included with the standard version of this mower (you can choose different battery packs when you order) is a 56V 5.0Ah Lithium-Ion battery. 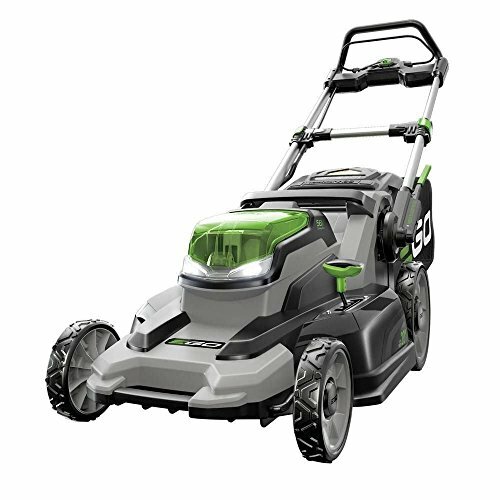 Being Lithium Ion of course means it won’t build up a memory, and being 56V means it packs some serious punch and can power through some of the toughest lawns. Included in this kit is the rapid charger which can charge the 5.0Ah battery in about half an hour – that’s one of the best charge times we have ever seen! 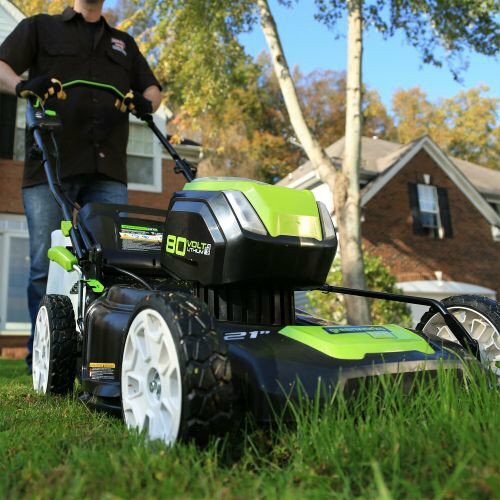 You can expect the 5.0Ah battery to last about 45 minutes of mowing time, which really should be more than enough to get a small – medium backyard finished. If you find you are running out of battery to soon, then we suggest ordering a second battery – it is money well spent! We were pleasantly surprised by the power of this cordless lawn mower – it pushes through even the thickets of grasses with almost no problems at all. We can even truthfully say that the Ego Power+ LM2001 electric mower out performs some of the gas mowers we have looked at recently – and this is impressive! The mower comes with 3 different attachments to allow you to mow your lawn the way you like. A grass bag allows you to catch all the clippings to dispose of as you see fit, the mulching insert redistributes the cut grass evenly back on your lawn and the side discharge chute can be used to have the cut grass ejected out the side of the mower. The mulching functionality works surprisingly well, and there is almost no sign of the cut grass after it leaves the mower. The LM2001 is surprisingly light and easy to maneuver around the yard. Navigating around garden beds, taps, kids toys or other obstacles is a breeze. The light weight of the mower means it is suitable for users who are not strong enough to push a gas mower, so it suits the elderly particularly well. The two small complaints we really have here is that the handle could do with a few more available positions as we found for some people it didn’t quite sit right. The other area which it lacks in is not being self propelled – but the weight of this mower is light enough for that to only be a very small concern. For those of you that live in a hotter area, you will know that the best time to mow your lawns is in the evening when the sun is going down and it is starting to cool off a bit. The headlights on this mower make this easy to do – illuminating your path should you be mowing in the dark. The headlights actually work surprisingly well and are not the gimmick that I first took them to be. The Ego Power+ LM2001 is super easy to fold up and store away. A simple lever at the base of the handle allows it to be folded down onto the mower and it can then be stored vertically – taking up very little of your valuable storage space. This means it can easily be stored in a small garage or garden shed and will not take up too much room – you will still have plenty of room for other toys – err…. I mean tools! The warranty of the Ego LM2000 is too good not to mention. 5 years on the mower itself is great, but 3 years on cordless lawn mower batteries? That is almost unheard of! 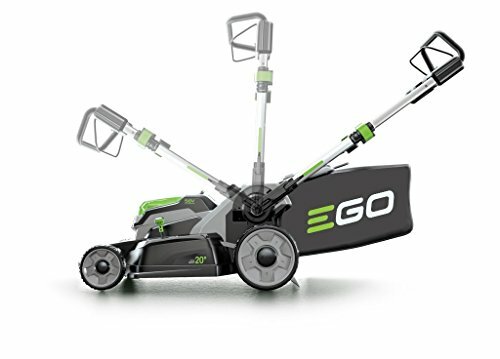 The EGO LM2001 Cordless Mower is available from Amazon. A no fuss mower that just works and does almost everything right. Worth the extra money. Running Out Of Garage Storage Space? Then you need to read our guide on garage storage systems. The black and Decker CM2040 often gets bad reviews, but in our opinion, these bad reviews are certainly not deserved. Not only is it a good cordless lawn mower, it is one of the best! Our feeling is that the negativity about this model is because people buy it without considering who it is designed for. Black and Decker CM2040 comes with 2 x 2.5 AH 40V Li-Ion batteries. 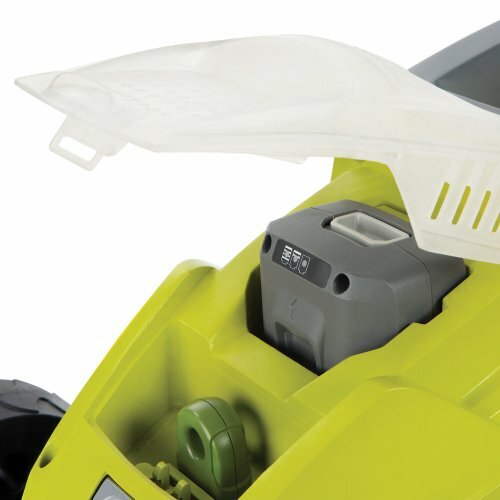 One battery is used at a time and the other one is stored in the storage compartment on the mower. When the first battery runs out of power it is simply a case of swapping them over, removing the need to go and find the second battery from the garage or shed. If you judge the runtime against the more expensive models, then, of course, you are going to be disappointed. But Black+Decker have done their best to keep the cost down and the weight as low as possible while still keeping the 20 inch deck. The batteries in the Black and Decker CM2040 get very hot while in use, so hot in fact that they will not charge immediately after being used! This is a little odd, as the exact same batteries used in a Black & Decker Trimmer do not get anywhere near that hot, but this is no doubt to do with the higher current draw. So you will need to let them cool down before charging them, which in reality means a longer charging time. 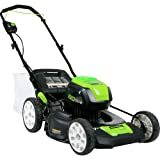 The mowing power is a little limited on this power, so if you are the sort of person who let’s your lawn go for months without mowing it – then give this model a miss. It really is designed for users with a smaller yard who mow weekly. If you do hit a patch of long grass, you may find that the motor struggles a little bit. The first time I used the CM2040 I could swear that I had bought a kids toy, it was so light and easy to push around – it just did not feel like a proper mower! But as I used it more Feels like a toy at first but is actually quite durable. The lightweight of this mower is great as it is super easy to push around obstacles and up inclines. It also makes it a breeze to lift up and hang on a storage hook if that is your preferred storage method. The mulching mode actually works really well with this mower, the grass clippings are chopped up nice and small and almost no visible trace is left on the lawns when you are finished mowing. It makes me sound really lazy, but I did love the fact that I did not have to go back to the garage to get the spare battery when the first one ran out. I simply took the spare battery out of the storage compartment and swapped them over and I was up and mowing again. 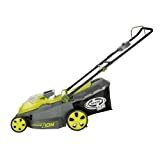 The CM2040 electric lawn mower is available from Amazon. This mower is designed for people with smaller yards who mow their lawns regularly. It’s easy to use, works well and is nice and quiet. The Sun Joe iON16LM cordless lawn mower is a no-frills, cost effective mower that is designed to do a specific job. If you have a small yard and need a mower that is quite small and maneuvers easily then this one may be exactly what you are looking for. A brushless motor is a great addition to this little beauty and it actually has reasonable power on such a small mower. The noise level is very low and won’t disturb even the most annoying of neighbors. The Sun Joe mower is the lightest in our best cordless mower lineup weighing in at just over 37 lbs. So, as you can imagine, it is super easy to maneuver around the yard. 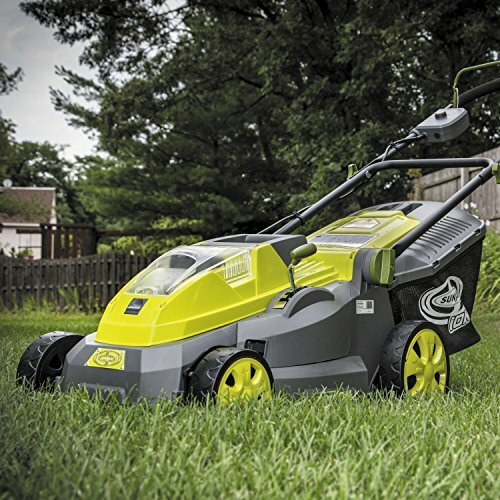 It does only have a 16-inch cutting deck, and while this does seem very small when compared to other models, you wouldn’t be buying this mower if you had a huge yard to keep under control. Our one complaint with its size is the small grass bag which did require emptying often, it was also a bit of a pain to fit back onto the mower. Storage of this mower is a breeze, with it folding up to take up a much smaller footprint – great for those of you with limited storage space. 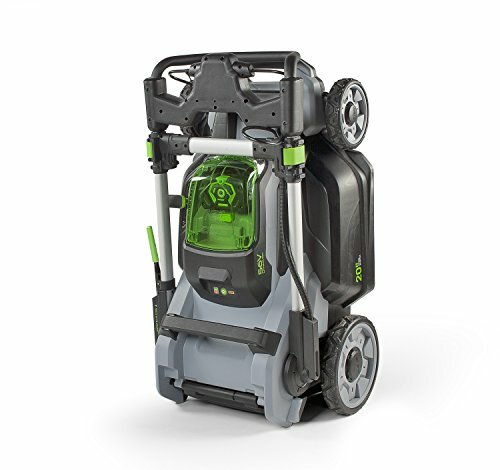 Sun Joe have even added a carry handle on top of the mower body to make it even easier to carry around when it is folded up for storage – this would be really handy if you had to carry it up and down stairs. The build quality is reasonable and what you would expect from a no-frills cordless mower. It does feel a little flimsy, but we believe it is more about keeping it as light as possible. The Sun Joe ION16LM is available from Amazon. Why Buy A Cordless Mower? If you are like myself, then in the past you may have considered cordless electric lawn mowers as a bit of a fad, and not worthy of your attention. The first generations of cordless lawn mowers were indeed a poor choice when compared to a gas mower, poor battery performance and low power motors meant that purchasing one of these mowers was a waste of money. But with the rapid improvement in battery and electric motor technology, cordless electric lawn mowers can finally be considered seriously as an alternative to a gas powered mower. There are many reasons why you should consider these devices, and in this section we will take a look at a few of them. How many times have you gone to mow the grass, only to realise that you never went and filled up that gas can after you used the last of it last time. So you have to get in the car, go find a gas pump and then come home and fill up the mower. Well with cordless mowers, you don’t need to worry about that any more. 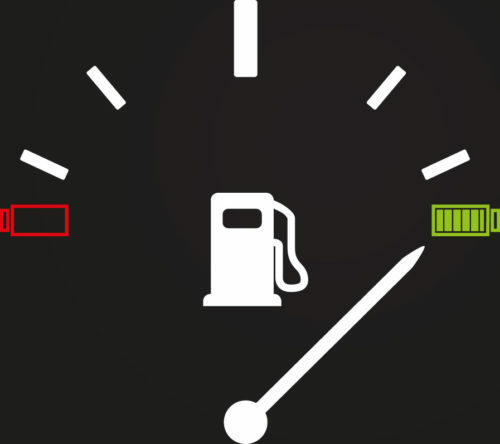 Simply make sure your battery(s) is charged after each use and you are ready to go next time! 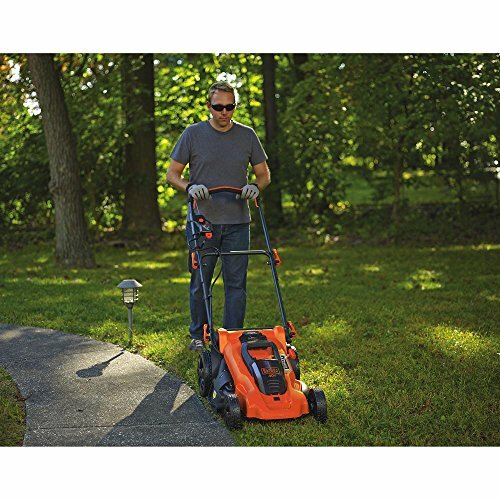 Cordless mowers in general weigh less than most gas powered mowers. This makes them much easier to push around the yard, and also means they are more user friendly to users who have trouble pushing a heavy gas mower. They are less tiring to use and you will find yourself feeling much less drained after pushing around a cordless mower. The best cordless lawn mowers are much less noisy than their gas powered alternatives. Most gas powered mowers range in noise levels from 84dB to 94dB – which is quite loud. Now if you compare a cordless lawn mower to this, the loudest cordless lawn mower we could find is 75dB, which is about the same volume as a standard washing machine. So if you are wanting to mow your yard early in the morning or late in the evening to avoid the heat, then you can do so with a cordless mower without disturbing the neighbors! Did you know that gas models contribute 5% of the USA’s greenhouse emissions? “Surely not!” I hear you exclaim, but it is true. Gas powered lawn mowers are not subject to strict regulations as motor vehicles are that require them to incorporate emission-reducing technology. Thus, they are pollution spewing machines! Because a cordless mower does not use gas, and instead rely on battery power – they are much more environmentally friendly. Even when you take into account the emissions required to manufacture the lawn mower and the electricity required to charge the battery, they are still considered to harm the environment many times less than a gas mower does. Very little maintenance is required to keep a cordless lawn mower safe and operational. It does not require a regular oil change as a gas mower does and can almost be classed as maintenance free. Of course you should always inspect your lawn mower before each use to make sure everything is as it should be and is operational, and cordless lawn mowers also need to be kept clean so their venting systems work correctly. But this is no different to any other type of machinery. There is a huge checklist we use when we are reviewing cordless mowers, and we wont bore you with that entire document here. We will however give you a quick run down of the basic areas we look at. This will help give you a better idea as to how each mower is scored. These days most decent cordless mower battery types are Li-Ion. But there are two other specifications on batteries that are important: Ampere Hours and Voltage. Want to learn more about these important details? Check out our cordless tool batteries guide. How easy a cordless lawn mower is to use is what we consider to be one of the most important criteria for a review. Charging procedure – how the mower is charged, where the charger is plugged in, is the battery removable? etc. 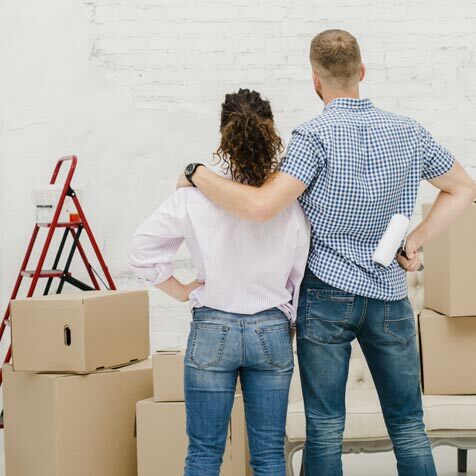 Storage procedure – is the mower easy to pack away to store? The deck width is essentially the width of the grass that the mower cuts in a single pass. A mower with a larger deck width will cut more grass and require fewer passes than a mower with a smaller deck width. Generally, a larger deck width means a better mower. But it also has downsides such as more weight, more power required and the maneuverability is generally lower too. It doesn’t take much brain power to think of reasons why weight is important in a cordless mower. After all, the lighter the mower the easier and quicker it is to push around the yard. There is nothing more annoying than having a mower that loses power when you hit the longest grass in your yard. And this is why another of the most important criteria for the best cordless lawn mowers is the power available to the user. The best cordless lawn mowers should be able to push through reasonably long and even wet grass without breaking too much of a sweat. This is one of the key criteria we judge a mower by as it makes such a huge difference to the users experience. Many cordless mowers come with additional features which I would not necessarily call standard. This may be anything from an auto-throttle which adjusts the power to the mower automatically, to headlights which you can use to mow when it is dark! We look at each additional feature and how well it works. While many users neglect to consider safety features as an important factor when selecting a cordless mower, we certainly do not. In fact – it has a high impact on our final scores as we believe user safety when mowing the lawns is of utmost importance. There are many safety features in use on most cordless mowers, from ensuring that the mower cannot be inadvertently started by a child, to safely directing sticks and stones that have been hit by the blades harmlessly to the ground.